1 gallon fresh raw goat milk milk will produce approximately 1 pound cheese. Heat milk to a boil. Add 1/3 cup lemon juice, apple cider vinegar or another acidic medium. This will cause the milk to curdle. Remove from heat. 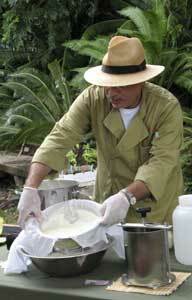 Hani Khouri strains curds from whey with a cheesecloth-lined colander. Stir in salt to preserve, can use coarse or pickling salt. Don’t use iodized. Optional: can add fresh chopped herbs — oregano, thyme, sage. At this stage, if you hang the cloth and let a ball form, you get mozzarella. 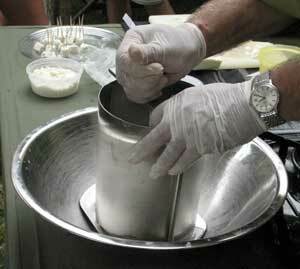 Pushing whey out with cheese press. Finished cheeses are in background. After it’s fully drained, put into cheese press (can get online at Gaiam). Press all the whey out, keep turning the press and keep pushing the whey out. Let it stand overnight. Don’t let the press stand in the whey. Take out cheese from press and remove cheesecloth, and let cheese air dry on bamboo mat for three days, turning frequently. Rub the cheese with coarse salt every day. Cook the cheese in brine (3 parts water, 1 part salt). The longer it boils, the more crumbly the texture. Be careful so the buttermilk doesn’t separate from the cheese. After cooking cheese, need to keep it in brine for storage. Serve as you would in a Greek salad, or with chopped tomato and olive oil, or with watermelon.